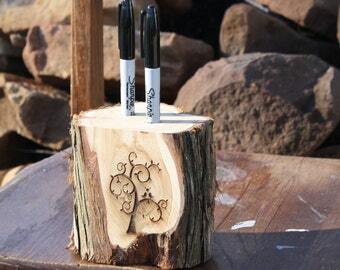 This is a bundled listing to purchase both our Rustic Tree Slice Guest Book and the rustic stump Marker/Pen Holder. Save a few $$ on the combo and on shipping! MEDIUM: between 16" and 17" in approximate diameter* at the widest and 2" in thickness. LARGE: between 18" and 19" in approximate diameter* at the widest and 2" in thickness. After the event, you may then choose to finish your unique guest book with wax or polyurethane to protect it's finish for years to come. This will darken the cedar considerably so be prepared to test the finish on the back first. It will also remain beautiful and fragrant unfinished. 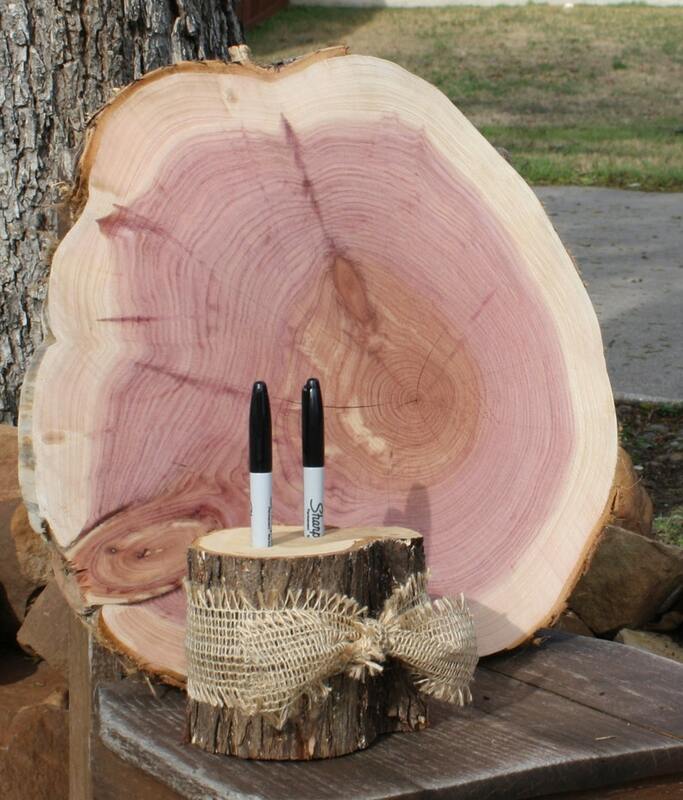 This marker/pen holder (cedar tree stump/branch) measures about 4.5" in height and has a diameter of around 4.5" at the widest part across. These measurements will vary somewhat as each piece is made to order. 2 small holes are drilled in the top to accommodate the sharpie markers as shown. The markers are for illustrative purposes and are not included. A little swath of burlap is tied around the center. Just leave us a message if you'd like to omit it. I ship by FedEx Ground. Transit times vary from 2-4 days for most US destinations. I will ship outside of US if you contact me ahead of time with your exact location and for a reserved listing with confirmed shipping amount.